The needles used in acupuncture are very thin (the size of a strand of hair). Some patients are more sensitive to acupuncture needles than others. Sometimes the patients will feel a tiny pinch on the insertion of the needle. After the needle is inserted, there might be a sensation of heat, numbness, achiness, throbbing, nerviness, or nothing at all. These sensations are normal, and generally mean the treatment is working as it should. If anything is sharp or very unpleasant, I will remove or manipulate the needle right away to ensure my patient is comfortable at all times. If something doesn't feel right, I will fix it immediately. Trigger point dry needling can create a very interesting sensation of the muscle jumping or contracting. Sometimes this kind of needling can be very strong; some patients find it unpleasant, while other patients find it to be a pleasant release. I always go at the pace of each individual patient. You are in charge. The number of treatments needed varies from person to person. During the initial exam I do my best to give an accurate estimate on how many treatments you will need to begin to see improvement. Most of the time improvement is seen after only one treatment; sometimes (for more chronic complaints) two or more treatments are needed. For quicker results it is important to follow dietary and lifestyle advice closely. At the beginning of the healing process weekly treatments are recommended. As you begin to heal, treatments are spaced further and further apart until they are only needed once a season or once a year! Acupuncture has a cumulative effect so it is important to stick to the treatment plan. For instance, if you need 5 treatments once every week, and you come once and then not again until 3-4 weeks later, it is kind of like having to start over. At this point in my practice, I am looking for patients who are committed to getting better. In return, you can expect a complete commitment to your health from me. Most insurance companies in PA don't cover acupuncture (yet). If your insurance does, or is from another state, you might be able to get reimbursed. I can give you a detailed receipt that you can turn into your insurance company for possible reimbursement. What to expect at my first treatment? The first treatment will be about an hour and a half in duration. You will begin by filling out a form about your complaint and past medical history. After you are finished we will go over your history and I will ask a variety of questions. After we finish with the interview I will have you lay on the treatment table and feel your pulse and look at your tongue. These are tools acupuncturists use to help them diagnosis. 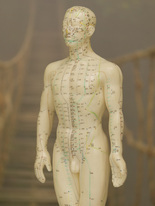 I will then begin pressing certain acupuncture points on your body and ask you if they are tender to the touch. This is another way acupuncturist diagnosis. After I have made a diagnosis I will begin inserting the (very fine) needles into different points on your body. Many of the points will be located below the knee and below the elbow, but depending on the complaint some might be inserted into the abdomen, head, or chest. After the insertion of some points I might ask if you can feel various sensations (such as warm, heaviness, tingling). If any point at any time becomes uncomfortable you can just let me know and we can adjust the needle or take it out. After all the needles are inserted I will lower the lights, turn on soothing music and leave the room for about 20 minutes. During this time some patients fall asleep, others enter a very meditative state, while others work on their breathing technique and just relax. After I return, depending on the complaint, we might treat the back with acupuncture and/or cupping/gua sha.